This interdisciplinary workshop/symposium planned for October 18 and 19, 2017 at University of California, Irvine (UCI) focuses on the remarkable – but almost lost –navigation and seafaring traditions of the peoples who traversed and settled one-third of the world. 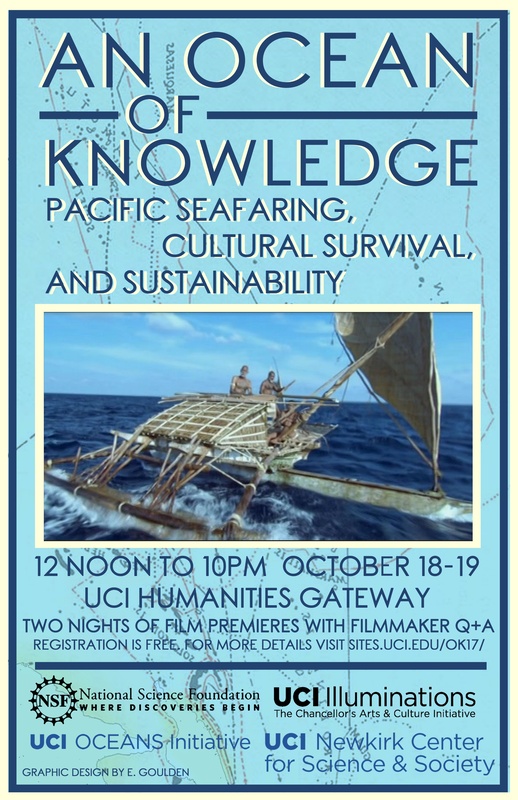 The event will consider the centrality of seafaring for Pacific Island cultures, focusing on the intersections of history, climate science, cultural survival, and Indigenous sustainability. Antonio Piailug + John Castro, leaders of the canoe and navigation program for the Department of Community and Cultural Affairs for the Commonwealth of the Northern Marianas (CNMI). Katie Allen, Executive Director of Algalita. http://www.algalita.org. Moneka De Oro, is a proud daughter of the Marianas, a mother, and a history teacher at Southern High School on Guåhan (Guam). https://independentguahan.com. The event will include a keynote, four thematic sessions, two film nights, two receptions, a boatbuilding demonstration, and a visit to the campus proa (sakman) building project Orthogonal. Keynote speaker, anthropologist Marianne (Mimi) George, has for 25 years worked with the people of the eastern Solomon Islands to help save their navigation and boatbuilding through the Vaka Taumako Project. Featured speakers include; Pete J. Perez, Executive Director of 500 Sails; Dr. Larry Raigetal with Waa’gey from Yap in the Federated States of Micronesia; Angelo O’Connor Villagomez with Pew Charitable Trusts; Dr. Judy Flores with the Micronesian Area Research Center; Mario Borja of the San Diego-based CHE’LU organization; Dr. Kristen Davis and Dr. François Primeau with the Department of Earth System Science, UCI, Katie Allen, Executive Director of Algalita, Eric Metzgar, founder and director of Triton Films. Master carver and navigator Antonio Pailug and John Castor will demonstrate Carolinian and Chamorro methods of wood carving and boatbuilding. In the presentation sessions, we will delve into the unique cultural and cognitive aspects of Islander navigation, wayfinding, boatbuilding and sailing techniques. We will review the science of climate change and sea level rise, specifically as it impacts island nations and the ecology of reefs and fisheries. We will bring these themes together to consider cultural and economic survival today, and for the future. We welcome attendees from Pacific Islander communities in southern California and elsewhere. Event is free to attend for all, but attendees are requested to register in advance. (Catering for receptions will not be guaranteed to those who register after October 3rd or non-registrants). The event will be held in Room 1030 of the Humanities Gateway with the film screenings at Winifred Smith Hall, UCI. Sponsors and supporters include the National Science Foundation, UCI Oceans Institute, UCI Illuminations, the Newkirk Center for Science and Society, the UCI School of Humanities, UCI Claire Trevor School of the Arts, UCI Department of Art and the Department of Community and Cultural Affairs for the Commonwealth of the Northern Marianas (CNMI). Director: Simon Penny, Professor, Department of Art, the University of California, Irvine. Associate Director: Dr. Sylvia Frain, the University of Otago, Aotearoa New Zealand & the University of Guam.